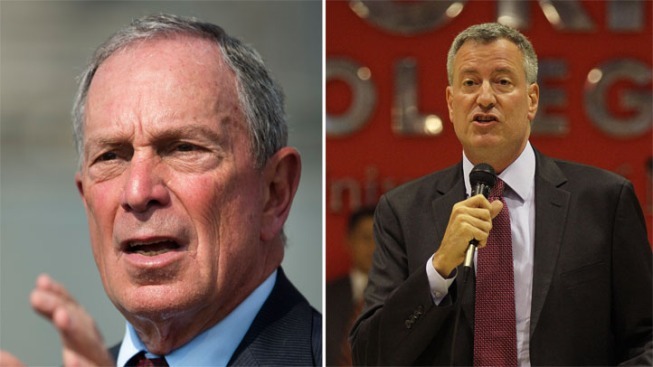 Bloomberg Calls de Blasio Campaign "Racist"
Mayor Bloomberg calls Public Advocate Bill de Blasio's mayoral campaign "racist" in an interview published online Saturday. In the New York Magazine interview, Bloomberg characterized de Blasio's campaign as "class-warfare and racist," elaborating that he was referring to the public advocate's use of his interracial family on the campaign trail. De Blasio's surge in the polls has been attributed, in part, to support among black voters embracing his message. "I mean he’s making an appeal using his family to gain support," the mayor told the magazine. "I think it’s pretty obvious to anyone watching what he’s been doing. I do not think he himself is racist. It’s comparable to me pointing out I’m Jewish in attracting the Jewish vote." Buzzfeed noted Saturday that Bloomberg did exactly that in previous mayoral campaigns; in 2005 he sent out an eight-page mailer featuring photos of him wearing a yarmulke, and appeared at a Brooklyn campaign appearance with balloons that read "Mike the Mensch." De Blasio called Bloomberg's comments "very unfortunate and inappropriate" at a rally Saturday afternoon and said he was "very proud" of his family. "I hope the mayor will reconsider what he said," he said. "I hope he will realize it was inappropriate, and I think the people of this city are ready to move forward." De Blasio's daughter, Chiara, also responded to Bloomberg's comments. "I can see from afar how people would think my dad was using his family but if you look at the facts he did not seek out a black woman 20 years ago to marry and then put on display, and my mom, my brother and I are all capable of making our own decisions," she said. De Blasio has a healthy lead in the race to become the Democratic nominee for mayor, according to a recent Quinnipiac University poll. In the poll, de Blasio had the support of 36 percent of likely Democratic voters. City Council Speaker Christine Quinn trailed at 21 percent, followed by Bill Thompson at 20 percent. The sampling error was plus or minus 4 percent.